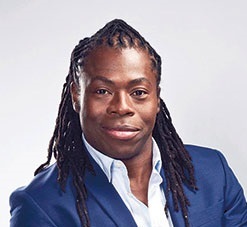 Retired Paralympian Ade Adepitan MBE has become the first Ambassador for Every Parent and Child (EPC). Ade has become a familiar face on TV as a presenter on the Travel Show, Unreported World, One Show, Channel 4 coverage of the Beijing, London and Rio Paralympics and, recently, he led the Channel 4’s coverage of the World Para Athletics Championships. A retired Paralympian, Ade discovered wheelchair basketball when he was twelve. During his early career Ade had one burning ambition, to win a medal in the Paralympics for Great Britain. This dream came true when he was as selected to compete in the 2004 Athens Paralympic Games. Ade continued to represent Great Britain, for five more years after Sydney. In that time he won a bronze, and a silver medal, at the 2002 and 2005 European championships. He also captained his country to a silver medal, at the 2002 World championships in Kitakyushu Japan. In 2004 Ade Adepitan achieved his lifelong ambition, winning a medal at the Athens Paralympics. In 2005 Paralympic World Cup held in Manchester, UK, Ade assisted GB to win Gold by scoring a free-throw in overtime. He also captained his country to a Silver medal, at the 2002 World Championships in Kitakyushu, Japan. Adding to his 2005 wins, Ade was a member of the GB bid team that secured travelled to Singapore and helped the UK win the London 2012 Paralympic, and Olympic games. In the same year Ade was also awarded the MBE for his contribution to disability sport.